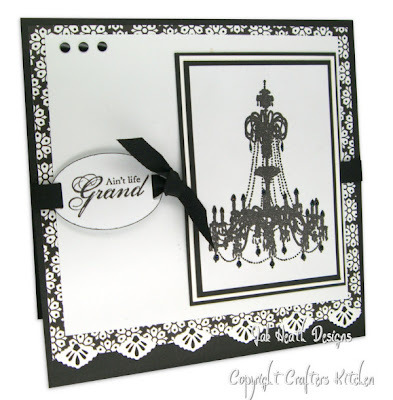 The stamp set used for this card is called Grand Soirée and is made by Stampin Up I had a thing for Chandeliers a few weeks back and made a free sheet full of chandeliers for you all to use and then I found this stamp set. It make a very striking card and by now I'm sure you all know that I love Monotone shades. If you fancy giving the chandelier card a whirl you can still download mine here, if you make a card leave me a comment with a link to your card I'd love to see them. FAB card and yep i downloaded the chandaliers you had on here little while back, didnt realise they did a stamp... had to go blog hopping to see if i can get one! its a gorgeous stamp and fab card! It's a very striking card, Jak! hi jak it is a good idea!! i hope u like my creations!! love that card! it is so pretty and the color combo makes it pop!